Back to Masdiar: having retired in early 2012, we were recently lucky enough to gain a rare insight into Masdiar’s life, and to witness the mark she has already made, by simply tagging along when she checked in on two of her ICABIOGRAD charges and mentees whose PhD studies were supported by GCP – Wening Enggarin and Joko Prasetiyono. 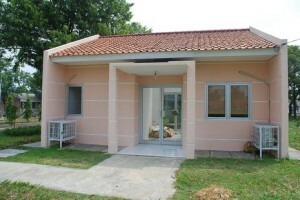 At ICABIOGRAD, Wening and Joko have both taken the torch from Masdiar for GCP projects, as well as for other projects. I grew up and lived in West Java for most of my life. My father was a farmer and my mother a housewife. I was their first of five children. I went to Andalas University in Padang and graduated with a Bachelor in Biology in 1974. After graduating, I worked as a staff researcher at a local horticulture research institute focusing on pests and diseases, particularly fungi in tomato soils. I was lucky early in my career to have opportunities to visit research institutes in The Netherlands, Japan and USA, all of which enhanced my skills. While in USA, I completed my Masters in rice blast disease – a fungus-related disease, which severely hampers rice yields in Indonesia, and all around the world. 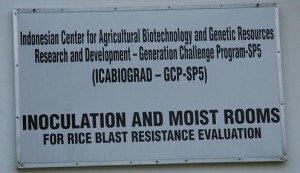 After my time in USA, I accepted a position at the International Rice Research Institute (IRRI) in The Philippines. This was the start of the second phase of my career, in which I began to focus on molecular biology. 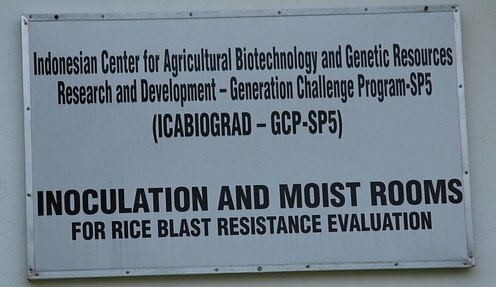 When I returned from The Philippines, I realised that we needed to improve our capacity to use molecular markers for breeding, which led me to take a job at ICABIOGRAD. When I first started at ICABIOGRAD we had empty benches. It took a lot of time and money to fill them with the equipment we have today. Rebecca Nelson from Cornell University in USA provided us with a lot of support in getting us started. We were involved in one of her GCP projects for two years working on blast resistance in rice. We were also working on another GCP project led by Abdelbagi Ismail studying phosphorus-deficiency tolerance in rice too, dubbed the Pup1 project. Joko was actually my PhD student for that project and did a lot of the work. 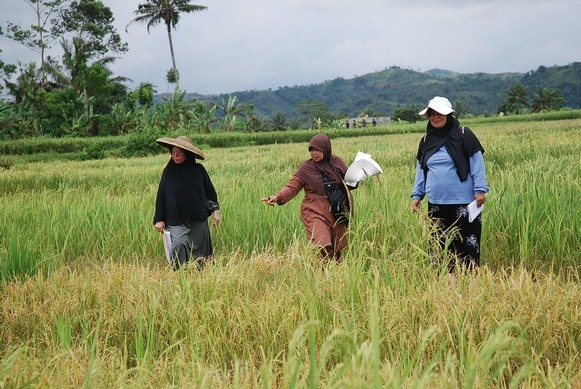 Selecting Pup1 lines in farmers’ fields in Sukabumi, West Java, in 2010. L–R: Masdiar Bustamam, Tintin Suhartini and Ida Hanarida Sumantri. Both Rebecca and Adbdelbagi helped me draft a proposal to GCP in 2007 for a project to enhance our capacity in phenotyping and molecular analysis to develop elite rice lines suitable for Indonesia’s upland regions. We had the understanding to do the science, but needed to enhance our facilities to carry it out. 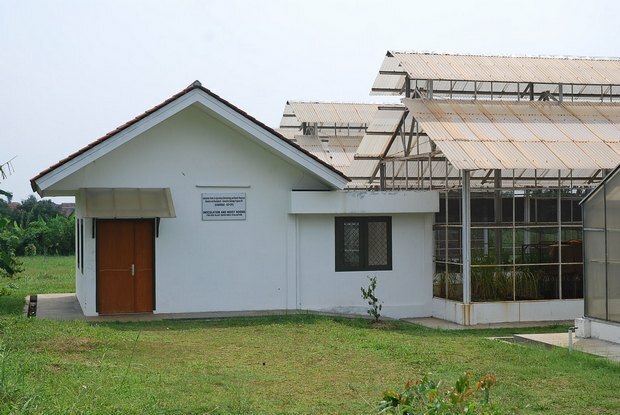 GCP recognised the need for such a project as many of Indonesia’s brightest researchers were leaving the country because of the lack of suitable facilities, and so funded the two-year ICABIOGRAD-defined capacity-building project. 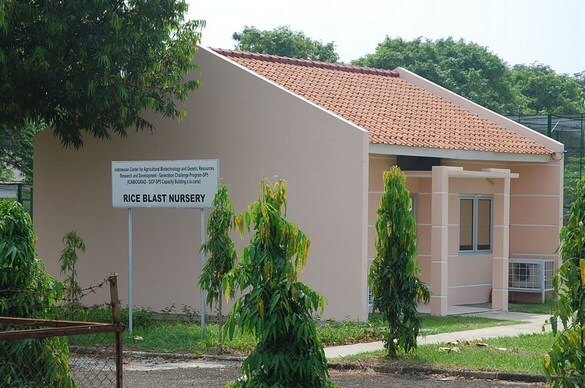 The grant covered – among other areas – intensive residential staff training at IRRI; PhD student support, which allowed Wening to complete her PhD; infrastructure such as a moist room, temperature-controlled centrifuge apparatus, computers and appropriate specialised software; and blast and inoculation rooms. Writer’s note: The tailor-made grantee-driven capacity-building project above was a cornerstone of GCP Phase I’s capacity-building strategy, and was dubbed ‘Capacity building à la carte’. With this historical note, we take an interlude here, to tour the facilities Masdiar has mentioned above. … and a close-up on the sign in the side view. …and a close-up on the sign at the front. After our tour of the facilities, Masdiar resumes her story: “That project really helped us out a lot and we are grateful to GCP for recognising the potential in us and supporting it so that researchers like Wening bloom and blossom, now and into the future,” says Masdiar glowingly of one of her mentees and successors. From generation to generation: Masdiar (2L) drops in on her charges and torch-bearers at ICABIOGRAD’s Molecular Biotechnology Lab. L–R: Wening Enggarini, Masdiar Bustamam, Tasliah Zulkarnaeni, Ahmad Dadang and Reflinur Basyirin. Clearly, Masdiar has made her mark, leaving a cross-generational living legacy in molecular breeding embodied in these young researchers.